The Black Arts Toneworks LSTR is the red-headed step brother of the Pharaoh. The LSTR provides even more fuzz and mayhem than its brother with the swell of low end you would expect from any Black Arts pedal. This Toneworks beast uses a uniquely interactive tone control circuit allowing for a traditional tone control as well as a control for scooping the mids right out of your signal. This tone circuit allows you to achieve Russian style scooped mids with a smooth attack or huge wide-open fuzz and perfect string definition with ease. The LSTR is hyper-active gain in a box that could get you sent to bed without dinner. I think i should give this one a go at some point. And Darlingtons! I thought it sounded a bit gated in the clips. I don't have any non polar cap at the 1uf range... is there a good source for them or can I just use electrolytic and tantalum capacitors? if so which was so the negative side go? i dont see a 1uf cap in this build, only cap I see with a 1 value is a 1n. tayda on ebay sells them (1uf boxed film caps). Didn't even try anything else in there. MPSA12s on this are not as bad as one might think. Interactivity between scoop and tone pots is probably the best thing is this. Well. I'm not impressed, though it is an ok BMP derivative. when i turn the tone to full, most sound goes away and i get a thin, sputtery kinda thing. sounds nice and full with tone all the way ccw, lose all sound around half, sputtery thinness at full. any ideas? btw i used 2n5089s, but I'm sure that doesn't matter. thanks guys! 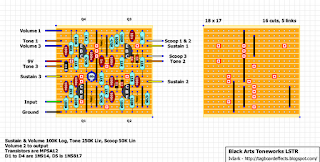 Check your soldering on the Tone and Scoop pots and also the tone stack components on the board, 1n, 10n and 68K. Sounds like a bad joint could be to blame. It says under the layout: "Volume 2 to output". That means volume pot's lug 2 is the output. I've just made it whole .. and it doesnt work for me. Only thing what it can do is tune the citizen radio :D... May I ask you for the original schematic please? It will help me a lot. Is this nice pedal verified? Anyone have any ideas why my tone and scoop pots are working as reversed volume controls and my volume is working like a tone? Any help would be greatly appreciated. Nevermind, built a new board and it works perfectly. 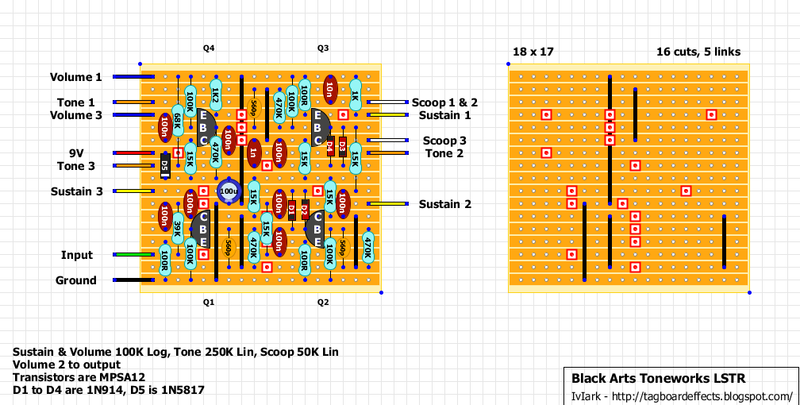 This is one of my favorite builds but I was wondering how to add a diode clipping switch like the Pharaoh. Really no any wiring to output from board? Only one from Volume pot?